Call Today to Make your Reservation at Tradicao! How do you like your steak done? Leave it up to the professionals for phenomenal service and a delicious, juicy steak cooked-to-order at Tradicao. 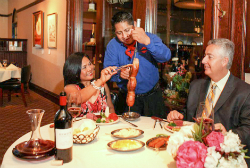 As the most authentic Brazilian steakhouse in the Greater Houston, TX area, Tradicao offers delicacies for lunch and dinner, as well as fine dining, private dining, events and catering services. Just like how we treat our name, we stay true to the foundations of the traditional Brazilian churrascaria. Tradicao is the Brazilian word for tradition, and that’s what we’re all about. We continue to grill in the way that originates in the “Pampas” of the Rio Grande de Sul, Brazil. As a family-owned business, our restaurant offers a world-class upscale dining experience that’s suitable for dinner dates, corporate gatherings, and special occasions. Our restaurant features the finest cut meats, amazing side dishes, desserts, and a full bar that includes red and white wines from all around the world. We host Happy Hour Monday-Friday from 4:30-6:30 p.m. With half-priced cocktails, wines by the glass and bar appetizers, there’s no better way to celebrate the end of the work day than with our delicious drinks and foods. Stop by with co-workers, a close-knit group of friends, or a date. No matter who you come with, Tradicao is the perfect atmosphere to relax and indulge in fine dining and delicious Brazilian delicacies. Whatever event you have coming up on your calendar, make the hosting of the party or gathering that much simpler with Tradicao’s catering service. We offer catering for all kinds of occasions: celebrations, parties, corporate gatherings and meetings or whatever else you have marked on your calendar! 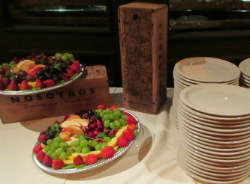 Rehearsal dinners, corporate parties and more! These are the perfect rooms to host these types of events. 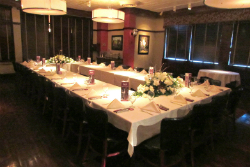 We will make your private dining experience unforgettable and an enjoyable one. With several rooms, you can be sure you’ll get the privacy that you’d like for your party while also receiving the best service from our staff. Even though you’re set aside in a private room in the restaurant, you won’t have to worry about being set aside from our staff. Whatever you need, we can provide for you. When reserving a party at Tradicao, you get to focus on sitting back, relaxing, and enjoying while we handle the rest. Call today to make your dinner reservation, plan an upcoming event or order our catering services!